A debut goal from Aylesbury United’s new Portuguese forward Bruno Brito earned the ten-man Ducks an unlikely share of the spoils at home to 10th placed Northwood. Having hit the post early on, momentum gradually swung away from United and they were further hindered by Jake Bewley’s sending off midway through the first half, withMax Holland’s goal giving Northwood a half-time lead. The visitors had enough chances to put the game to bed, hitting the woodwork on four occasions, but they were unable to do so before Brito popped up to ensure what could be an important point come the end of the season. The result means Aylesbury will go into Christmas with a five-point cushion over the bottom two in Division One Central. 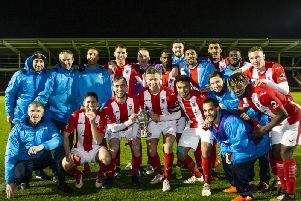 Aylesbury had initially started well on Saturday as, with just six minutes on the clock, Alvin Rajaram latched onto a sublime 45-yard through ball from new boy Brito and cleverly chipped advancing goalkeeper Berkley Laurencein, who just got enough of his glove on it to divert it onto the post. Brito then found himself on the end of a long pass but his effort was comfortably dealt with by Laurencein, and he fired another attempt well over the bar moments later, following Northwood long shots from Niko Muir and Louis Stead which didn’t threaten Zaki Oualah’s goal. But the tide then turned firmly in Northwood’s favour as after Max Holland had struck the post, Aylesbury found themselves down to 10 men when Bewley was dismissed for a professional foul. The subsequent free-kick crashed against the crossbar and with Aylesbury now on the back foot, Northwood had numerous chances to go ahead before Holland’s 43rd minute goal gave the visitors a 1-0 lead. More Northwood pressure followed after the break and they hit the woodwork once again while home keeper Oualah saved from Holland. A second goal seemed inevitable but instead it was Aylesbury who unexpectedly struck next with Shaun Owens’ ball into the box flicked on by Alex Collard, and there was Brito to rifle home a good finish. With the best part of 25 minutes to play, United’s work was far from done, but Northwood continued to be wasteful in front of goal and the Ducks held on for an excellent draw. Next up for Aylesbury is the Boxing Day derby against rivals Aylesbury FC.